Happy October, friends! For those of you who don’t know (and haven’t noticed I’m a total Libra), my birthday is this month! I used to love celebrating my birthday as a child and especially as a teenager, but as I’ve gotten older, it’s lost a lot of the pizzazz (adulthood has a way of really making things bland, huh?!). I’ve also been tossing around ideas for paying-it-forward and wanted to do so around my birthday. I know there are loads of ways to do this (like collecting donations for charity in lieu of gifts – a past colleague of mine did this and I thought it was great), but I’m taking another route: I’m going to be hosting WEEKLY (!) Giveaways during the month of October to share the love with you, my loyal readers! Every Wednesday in October (7th, 14th, 21st & 28th), I will post the new giveaway details here on the blog. I’ll include what you can win (most of which will be my creations! And maybe a few goodies handmade by people I love) and how you can enter. You will have until Friday Sunday at midnight to enter. See Entry Rules below for more information. I will be using Rafflecopter to “host” the giveaway. To enter, you will follow the link at the bottom of the post which will take you to the Rafflecopter giveaway where you will enter. You’ll be given multiple options for entry ranging in “value” (number of points it will get you) so that you can choose which method(s) you would like to use to enter. You can find more information on what it’s like to enter a Rafflecopter giveaway here. UPDATE: I had issues embedding the giveaway (long story short: WordPress + Rafflecopter = a gamble with whether it’ll actually embed – there are many reasons why and it appears I fall into one of those). Because of that, you will need to follow the link at the bottom of the post to Rafflecopter’s site where the giveaway is posted. Entry is the same as it would have been – you are just opening a separate window to do so (sorry for the inconvenience). Subscribe to receive blog posts via email – If you’re not already, you can “subscribe” to my blog to receive new posts via email. If you’re on a computer, look for the box matching the image below in the upper right corner of your screen. If you’re on your mobile device, scroll all the way to the bottom and it will appear. Enter your email address into the bar and click “Follow.” Boom. 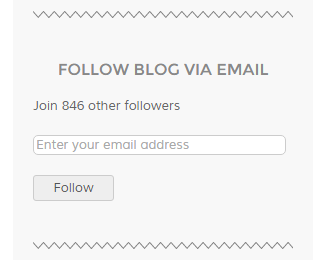 Now you’ll receive an email each time I post something new to the blog. Because the automation of today’s technology is much more consistent than my memory, subscribing via email is the best method to guarantee you’ll hear about the giveaway. Follow me on Twitter – I have set up the blog so that it will automatically tweet a link to new posts as they are published. You can find me on Twitter here or search for @jordslice11. Follow the blog on Facebook – I will be posting links to the giveaway after they have been published on the blog’s Facebook page. To receive alerts via Facebook: Make sure you have “Liked” the Facebook page. Then hover over “Liked” or click the carrot (downward pointing triangle) to display options (see image below). 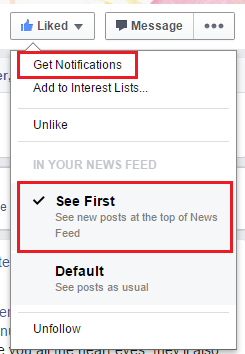 Select “Get Notifications” to receive a notification each time something new is posted to the Facebook page. Additionally or rather than, you could also select “See First” to see new posts at the top of your newsfeed (on your Facebook home page). Follow me on Instagram – Each Wednesday I’ll post a picture of the week’s giveaway prize. Follow me on Instagram here or search for @jordslice11. Entry Rules – Make sure you read them all! For each giveaway, you will have until Friday Sunday evening at midnight to enter. You will be required to submit your mailing address when you enter the raffle. This information will only be used if you win the raffle. Additionally, you will also be required to submit your email address so that I can contact you to let you know you have won. I will email the winner by Saturday afternoon and will announce the previous week’s winner on the new giveaway post for that week (each Wednesday). Shipping of prizes – Giveaway prizes will be shipped via USPS to the winner. I’m sorry, but due to the high costs of shipping (and this being a sole investment of yours truly), this giveaway is only open to recipients with a shipping address within the continental United States. Prizes will be shipped to the winner no later than the first week of November 2015. Winners will be sent a tracking number via email when the package is shipped. I am not responsible for items lost by the postal service. In all the time I have been shipping my goodies, I have not (*knock-on-wood! *) had this happen so I’m very hopeful we won’t run into this issue, but if we do I cannot replace the item. Who can enter – As stated above, I am only able to ship prizes to mailing addresses within the continental United States. You can only enter each giveaway once. If you win one of the giveaways, you are still eligible to enter the future giveaways (meaning: you can win more than one of the giveaways!). Disclaimer – This blog is run by little ole me (remember me?) and only me. That being said, I reserve the right to modify these rules as necessary (this is a learning process – it’s my first giveaway). I will reserve this right for emergency situations where it is truly necessary for me to change the rules (I like to stick to my word – I am a Southerner, after all 😉 ). 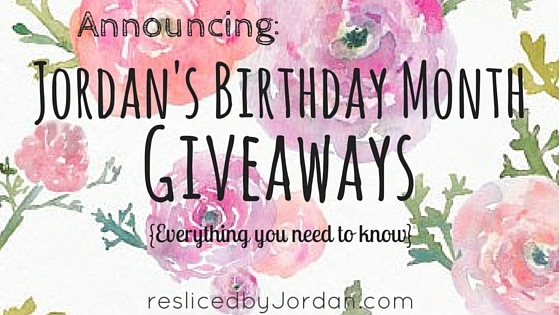 Social Media – I would love love love it if you share about the giveaway on Social Media! You can tag me on Instagram and Twitter with my handle: @jordslice11. I will also be posting links to the weekly giveaway on the blog’s Facebook page so you can share with your friends there. Additionally, if you win a prize, I would love it so very much if you post a picture of you enjoying your prize to social media and tag me. Seeing others enjoy something I’ve made (or something I love), makes my heart so happy. And “waste not, want not” – I’ll pick a winner from this sample giveaway to send a Rachel Tenny postcard (I just stocked up on her latest collection!) – because who doesn’t love snail mail? !